An existing client, Tom McDermott-Walshe of Fine Framers in Carlow, was excited to be bringing a new advertising medium display system to Ireland, after seeing at a Trade Show in Las Vegas just how effective it is. Because of the success of is earlier website, he returned to us to ask us to showcase his new products too. We consulted with Tom in depth to learn all about the possibilities and versatility of this exciting new product. We advised that as it was so new to Ireland, SEO would be difficult – people were not yet searching for these terms as they either didn’t know that the product existed, or else what it was called. Tom agreed and instead asked us to build a ‘brochure’ website that would nonetheless rank well for those terms, while he directed sales leads towards it from other means such as Trade Shows. A fully responsive website design in an attractive colour scheme to maximise the ease of user experience was first agreed upon. Appropriate imagery and video were then sourced to highlight Fabric Light Box, their possibilities, and their convenience, while a specialist copywriter created all the text content, based on material supplied by our client. All came together in a succinct and effective manner on the finished website . 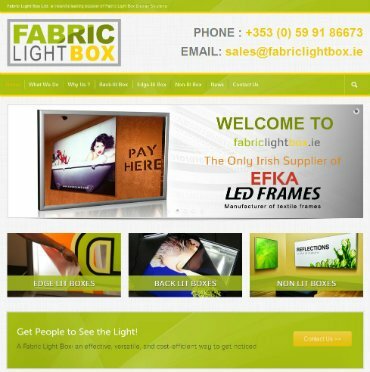 Within weeks, there was an inquiry from a major multi-national firm on a potentially lucrative order to supply Fabric Light Boxes for a major international conference at one of Ireland’s most renowned venues.